Seals nails with long-lasting shine. Provides nails with durability to protect nail color and resist chips, dents or peeling. Nails will look freshly manicured for weeks! Removes sticky gel residue. Use with Cleansing Wipes. Soaks gel polish off in 10 minutes. Use with Remover Wraps. If gel is resistant, rewrap the nail and soak an additional 10 minutes. Lint-free square-shaped cleansing wipes. After curing Gelaze Gel Top Coat, use it with Gelaze Gel Cleanser to remove sticky gel residue. Convenient all-in-one pre-cut foils with absorbent sponge for easy gel or nail polish removal. Use to quickly remove any Soak Off Gel Polish or stubborn glitter nail polish. 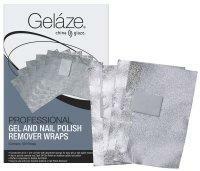 Use with Gelaze Gel Remover.